Bamboo Gallery II — Tech Product Specialties, Inc. The world around is alive with technology and yet we cling to the properties of nature to yield a feeling of comfort in our constructed environments. In the process of taking bamboo from a stalk to turning it into plywood it is touched by technology multiple times. And then we can take that product and touch it again, invent new things to make out of it and create designs that just can’t be done out of other materials…just because it’s bamboo. 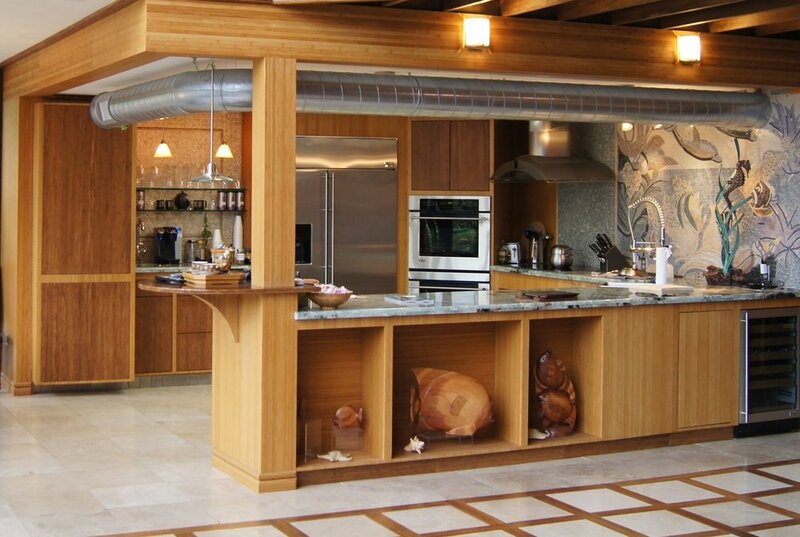 ^ A kitchen done in bamboo is a great place for culinary creativity. ^ Bamboo creates the perfect place to show off your favorite things! A work space should never be this clean…It was new. The tops are a double layer of 1” bamboo 3-ply; the credenza front is coco palm flat grain; the insert at right is edge grain coco palm.